Chris Marker (born Christian Hippolyte François Georges Bouche-Villeneuve) was a French writer, photographer, documentary film director, multimedia artist and film essayist. His best known films are La jetée (1962), A Grin Without a Cat (1977), Sans Soleil (1983) and AK (1985), an essay film on the Japanese filmmaker Akira Kurosawa. Marker is often associated with the Left Bank Cinema movement that occurred in the late 1950s and included such other filmmakers as Alain Resnais, Agnès Varda, Henri Colpi and Armand Gatti. His friend and sometime collaborator Alain Resnais has called him "the prototype of the twenty-first-century man." 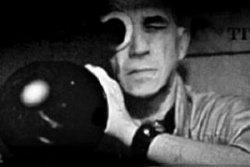 Film theorist Roy Armes has said of him: "Marker is unclassifiable because he is unique...The French Cinema has its dramatists and its poets, its technicians, and its autobiographers, but only has one true essayist: Chris Marker." 1989, France/Greece, col., Beta sp, Television Mini-Series, 13 episodes x 26'. Eleni Karaindrou (solos/Ian Garbarek/Nana Vasconcelos), Christelle Kosc/UPIC, Krzystof Penderecki, Herbert Windt, Michel Krasna [C.M. ], J.s. Bach, Iannis Xenakis/UPIC, François-Bernard Mâche/UPIC, Christelle Kosc/UPIC, Pierre Bernard/UPIC, Leos Janacek, Giovanni Fusco, Ludwig van Beethoven. Videos were converted from Flash files found on JAFB's Viddler account. Gratuitous thanks to the original uploader. Uncut version of the interview with Cornelius Castoriadis, video, 81 min. Commentary. Lettre de Sibérie [Letter From Siberia], 1957. Le Joli mai, with Pierre Lhomme, 1962. Cinétracts, with Jean-Luc Godard and Alain Resnais, silent, 1968. La bataille des dix millions, 1970. Le train en marche, 1971. La Solitude du chanteur de fond, 1974. L'Héritage de la chouette, 1989. Si j'avais 4 dromadaires, 1966, 49 min. A bientôt, j’espère, with Mario Marret, 1967. La Sixième face du pentagone, with François Reichenbach, 1968. Le Deuxième procès d’Artur London, 1969. On vous parle du Brésil, 1969. Les Mots ont un sens, 1970. Vive la baleine, with Mario Ruspoli, 1972. On vous parle du Chili, 1973. Puisqu’on vous dit que c’est possible, 1973. Junkopia, with John Chapman and Frank Simeone, 1981. Une journée d’Andrei Arsenevitch, 1999. On vous parle de Paris - Maspero, les mots ont un sens, 1970. François Maspero interviewed by Marker. 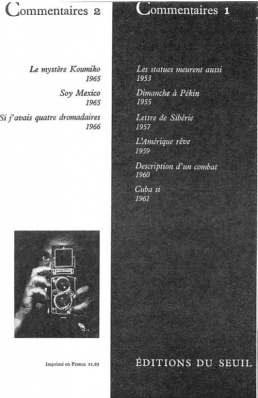 Finn Brunton, "Chris Marker, 1921–2012: Future anterior", Radical Philosophy 176, Nov/Dec 2012.